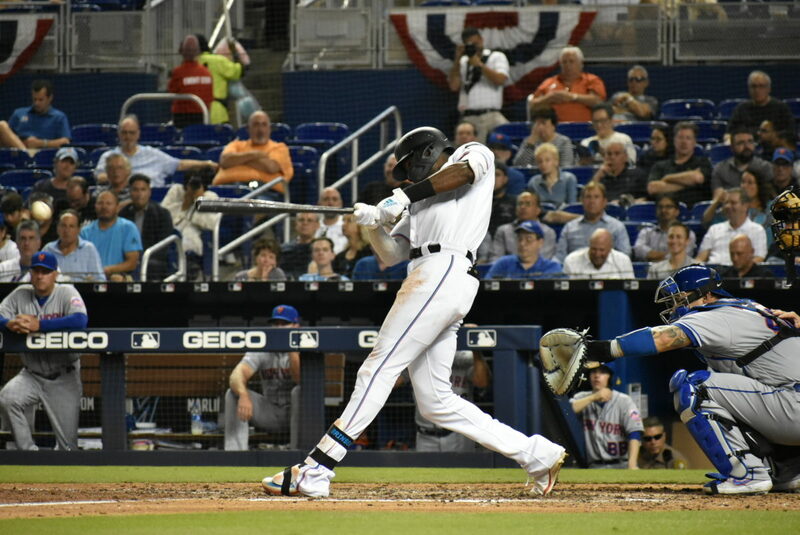 Miami, FL – The Miami Marlins suffered a heartbreaking loss Tuesday night, falling 6-5 to the New York Mets after Jose Ureña (0-1, 9.64 ERA) got hammered for five runs in the first inning. Miguel Rojas lined into a game-ending double play with runners in scoring position, ceding the series to the Mets. Ureña struggled right out the gates. The Metropolitans quickly got two aboard with a pair of singles as Ureña eventually found himself in a bases-loaded pickle with one out. The boys from Shea pounced with two straight RBI singles followed by a 2-run double by Amed Rosario. The Fighting Fish scored a run in their half of the first with Brian Anderson hitting a sharp line drive to left field, scoring veteran Curtis Granderson on his first double of the year. Despite giving up another run in the seventh, Miami gradually chipped away at the Mets’ lead. Starlin Castro hit his second homer of the year, a solo shot in the fifth with Lewin Brinson and Peter O’Brien smacking line drives in the seventh to put Miami to within two runs. Same as last night, the Fish had a chance with the bases loaded, this time in the eighth. JT Riddle did better, scoring Granderson on the groundout to first. Jorge Alfaro, however, followed yesterday’s script and struck out to end the inning. Just when the Marlins looked like they might create some magic in the ninth, Rojas lined out straight to Rosario at short for the quick 6-4 double play to end the game. Brinson had absolutely no chance to make it back to second. This one stings a bit. After an encouraging series split with the Rockies, winning both Saturday and Sunday, the Marlins lost the series against the Mets. They will try to salvage a game tomorrow night. The Marlins went up against a familiar face. Jason Vargas made his 2019 season debut, having played for the Marlins way back in 2005 and 2006. It was nice seeing Vargas again. In that era, he was a young rookie that was highly regarded in the organization. They were the Florida Marlins then. They drafted Vargas out of Long Beach State with their second-round pick in the 2004 MLB draft. He made his MLB debut on July 14, 2005. To put this into perspective, I had JUST graduated from high school. But no time for trips down memory lane, it’s full of potholes anyways. In his first year, Vargas was 5-5 sporting an OK 4.03 ERA in 13 starts. 2006 was a down year finishing 1-2 with a 7.33 ERA in 5 starts. He was moved to the pen where he continued to struggle before ending up back in the Minors. Here for #Marlins #Mets it’s Ureña vs Vargas. Jason Vargas as some remember made his debut with the Florida Marlins in 2005. The only other player still in the major leagues from that ‘05 squad is Miguel Cabrera. Vargas got his first taste of victory, going five innings giving up two earned runs on eight hits. Starlin Castro does it again, claiming his second bomb of the season going 3-for-5 on the night with an RBI to boot. Yesterday I was offering some praise for the starting rotation. Everyone except one. Ureña. If anyone was watching, you know Opening Day was a rough one for him. The righty ended the season opener with 4.2 innings pitched, giving up six runs (5 Earned) on nine hits, surrendering a home run to Trevor Story. The Colorado Rockies won it 6-3. While it certainly sounds like an oxymoron, the Marlins’ worst pitcher (so far) is their ace. He remains winless with an ERA north of 10. It’s still very early but could he struggle as bad as he did last year? To refresh your memory, Ureña didn’t win at all in April or May. He didn’t record his first W until June 5th at St. Louis, his 13th start of the season! I really doubt it’ll get that bad but the guy is being looked at to lead the young core. To anchor the pitching rotation. In his defense, he’s had that one really bad inning in both of his starts that’s helped inflate his disgusting ERA. There can always be a big turnaround, offensive production permitting. But seeing is believing and our “ace” is anything but. Until we meet again Marlins faithful, stay frosty.